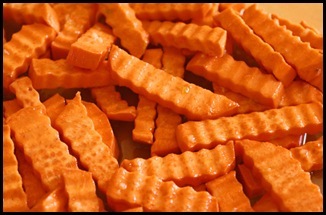 After struggling with the mandoline to create sweet potato waffle fries, I went with crinkle cut fries. 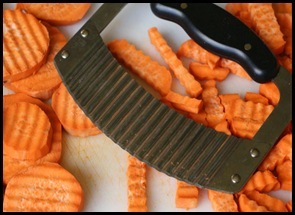 My Pampered Chef mandoline isn’t set up to make them without a lot of hassle. Plus I was having a tough time getting a consistent cut. Instead, I used my Pampered Chef crinkle cutter. 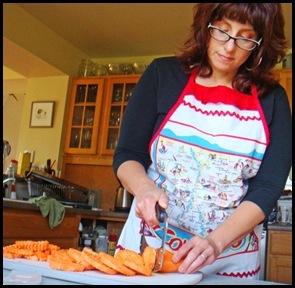 It’s so easy to cut sweet potato French fries with it that a child could use it. (With some supervision, of course.) What’s nice about the crinkle cutter is that you can make fat fries, skinny fries, long fries or short fries. It’s also great to use on other veggies for salads or stir fries. Pictures of me courtesy of my kids, Nathan and Lucie. The baked sweet potato fries were a big hit with my kids and they were disappointed that I didn’t make a double batch. This is the same recipe as the Baked Sweet Potato Margarita Fries minus the olive oil, and cooked the sweet potato fries in canola oil on the stove top. The result was chewy, but just as delicious. However, frying is messier and not as healthy, so my advice is to stick with the baked method instead. Take each round disk and cut into fries, about 1/2 inch to 3/4 inch thick. In a bowl, mix the minced garlic, olive oil, salt, agave nectar, lime juice and lime zest together. 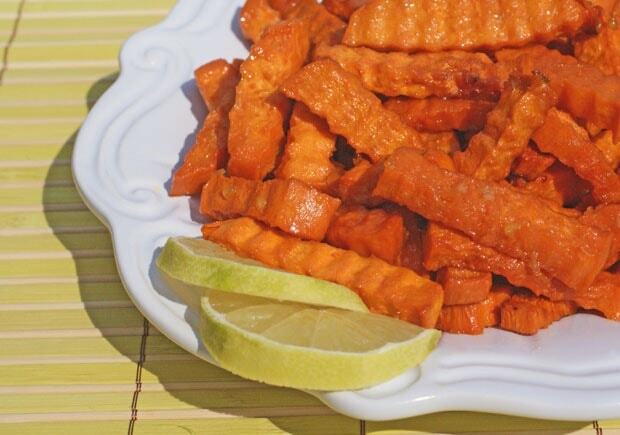 Add sweet potato fries to bowl and toss to evenly coat. 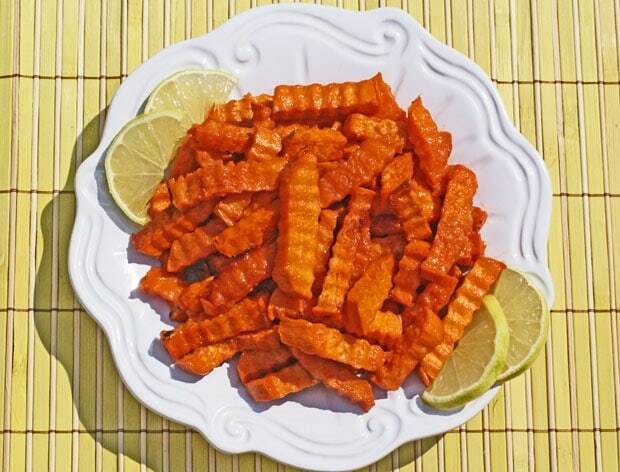 Place coated sweet potato fries in a baking dish or on a baking sheet. Place on the upper rack of your oven and set timer for 10 minutes. 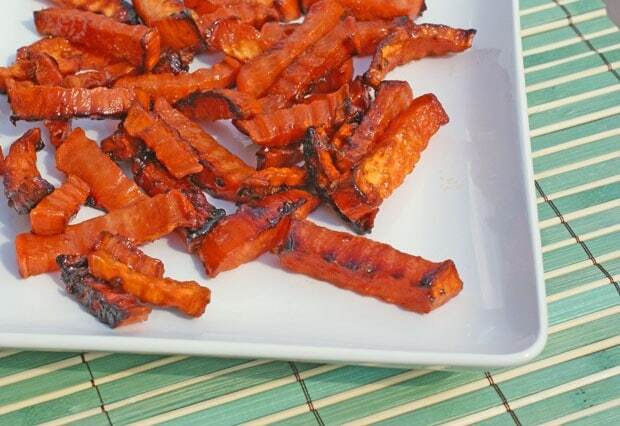 When 10 minutes is up, take an oven save spoon and carefully stir sweet potato fries. Close door and set timer for 10 minutes, and repeat until fries are done. They should be firm, not mushy, and should start to caramelize on the edges. Serve with salt and lime slices so everyone can add more salt and lime flavor if they wish! 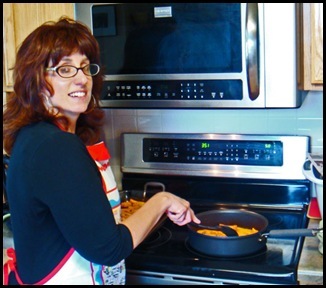 Posted in Gluten Free, Recipes, Veggies and tagged potatoes on July 19, 2011 by Anne-Marie Nichols. I could do some serious damage with these. I love that they’re baked and not fried. A perfect finger food. I love sweet potato fries and I love margaritas. This could be a match made in heaven. I’ve only looked at your French fry recipe because it was on StumbleUpon. Otherwise, I don’t want to know what I’m up against!